Halloween really marks the start of a season of decorating. Think about it, after the jack o’lanterns will come the cornucopias and turkeys, then the holiday lights, candles, or trees will start to appear! So, needless to say, it’s important to start these months of amazing decor off with a bang. Need a little inspiration to take your Halloween decor from cutesy to spooky? Then you need to check out these 13 homes that went above-and-beyond in the scares department. Whether or not this All Hallows Eve decor is over-the-top or incredibly epic is up for you to decide! Every neighborhood has at least one – that house that takes holiday decorating to a whole new level. This homeowner in Rockville Center, Long Island, NY is that house. 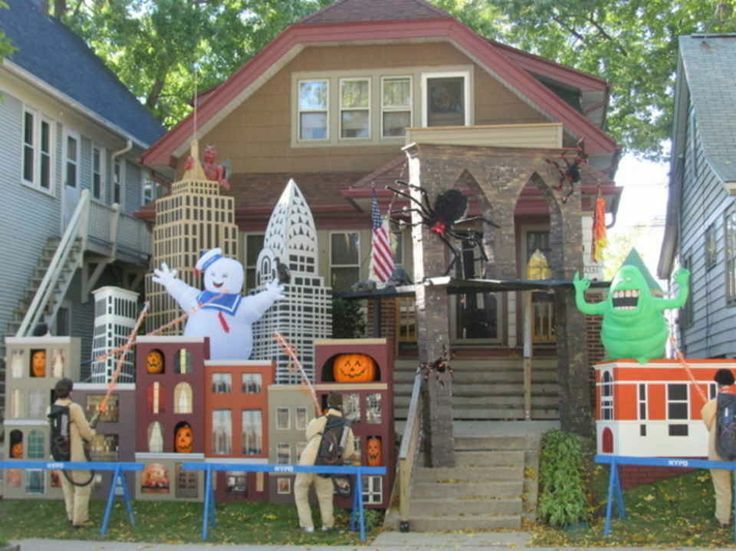 A Reddit user posted this picture from a few years back featuring one of the resident’s infamous Halloween landscapes. Want to send a message this Halloween? This one says: ENTER IF YOU DARE, loud and clear. If you’re throwing a Halloween shindig or if you tend to invite trick or treaters in for some apple cider, the inside of your house has to be as spooky as the outside. Enter, this super spooky parlor decor. Um, judging by the size of those spiders, animal control? We can only hope their insurance company covers intergalactic accidents. Why have one jack o’ lantern when you could have literally dozens? 7. Did You Hear About Pop Music? This is definitely going to start your Halloween off on the right note…if you know what we mean. If you REALLY want that candy, you’re going to have to work for it! 11. Amazing Decor Off the Starboard Hull! Creepy, bloody dolls in your yard are one thing – but then add CLOWNS into the mix? That’s a big ol’ NOPE for us, thank you very much. What’s better than a few of your favorite movie creatures to make your decor truly extra?